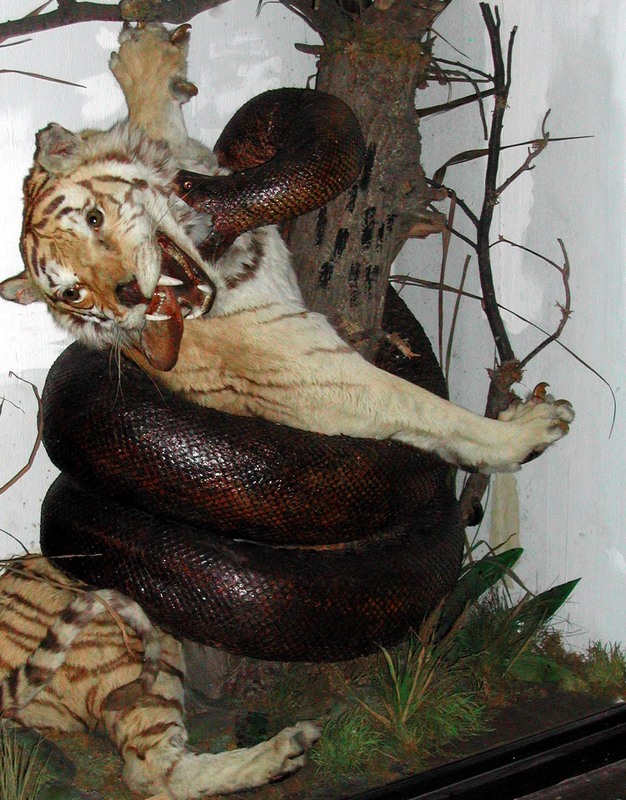 In the previous post, “Is it Real?” I posted a picture of a taxidermy mount showing a tiger fighting a python. The question was intended to replicate that of many visitors to museums, particularly children. I was delighted at the responses. So is it real? We can approach the question from many different angles. At the most basic level, of course it’s real. It’s a physical object standing there in front of you. This isn’t The Matrix, how more real do you want? But in another sense, it’s not real. These are not living animals, just their skin and fur. There is no life left, and so perhaps the ‘reality’ has been removed. But those are two ends of the spectrum. Matt Williams, in commenting on the previous post, addressed this “yes and no” perfectly. When we talk of this specific piece, the question of reality is first addressed by its original owner. The piece was displayed in William Bullock’s London Museum around 1813. When this collection was being sold in 1819, in a letter to Robert Jameson of the University of Edinburgh, Bullock referred to the tiger/python as being the only fake in the collection. So we can see its owner and vendor does not consider it real. Why not? Firstly, the python itself is a composite, with two separate bodies joined to make a longer snake. The head is entirely a construct, made of painted wood. So, to Bullock, this made the specimen a fake, something decidely unreal. Secondly, the scene itself is labelled as artificial. The 1893 label suggests taking the piece as an example of the skill of the taxidermist, not a representation of any real event. So we have an artificial scene, and at least one partially artificial animal. So surely it’s not real? 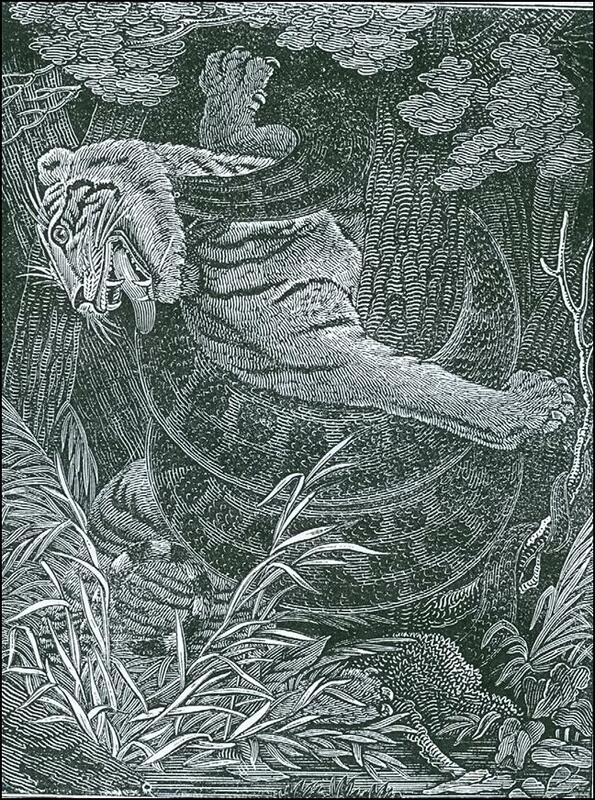 This is an engraving of a painting called Tigre Royal embroire par le serpent by Vicomte Alexandre-Isidore Leroy de Barde, dated 1814. The original is in The Louvre in Paris. It is, quite clearly, based on Bullock’s Tiger and Python mount. Vicomte de Barde painted many still-lifes in Bullock’s Museum, and this is one of them. So we can again see this concept of the afterlife of animals coming through. Though dead, mounted, and even artificially extended, the animals take on a new existence. The specimen actually has a large chunk of its history missing. Between its sale in 1819 to William Cross, and its donation in 1893 to Norwich Castle Museum, there is no record of where it went. In 1930, with Norwich staging a redisplay, the Tiger and Python was donated to Rossendale Museum, Rawtenstall, where it stands today. So the original catalogue is actually quite clear this does represent reality. Not a specific observed scene, but certainly something known to occur. Paolo Viscardi actually beat me to the punch here, in posting in the comments section a link to a very interesting video. No attack is shown, and tigers will scavenge, but the family shown here are not averse to snake meat. So to return to our original question one last time, is it real? I would argue that the history of this object in the 200 years since it was made gives it a very solid, and fascinating, reality. Alexander, E. P. (1985), William Bullock: Little-Remembered Museologist and Showman. Curator: The Museum Journal, 28: 117–147.